It is important to maintain humidity of a unit not only for quality reason i.e. 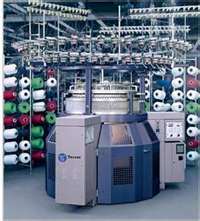 for operations efficiency or minimizing yarn breakages, but also right humidification helps in maintaining regular weight of a textile material, establishing a healthy environment (less pollution by loose air borne fibres, reducing dust and pollutant suspension which leads to less headache and dry mucous membranes among the employees). Humidification is maintained by simply adding water to the air. In this article I have first explained various terms used above and later discussed on three methods of managing moisture in knitting floor - Adiabatic cooling, Atomization method and direct water injection. During the knitting operation carriage yarn is pushed over the previously placed yarn thereby increases the abrasion among the yarns which finally leads to yarn breakage. A Precise control of yarn tension for knitting operation, particularly for hosiery products, generally requires control on temperature and humidity to control abrasion. Recommended conditions for prevention of the breakage are 25 ± 1.1°C and 55% ± 5% RH. Increasing this RH value results in ball formation of the protruding fibres of the yarn and this ball get stuck in the knitting machine resulting in yarn breakage and also when the RH value goes down the prescribed value yarn breakage takes place due to friction between the yarn and the machine. Thus it is necessary to maintain optimum Relative Humidity. The cotton yarns for knitting are coated with wax majorly to reduce the hairiness of the fibre which is the measure of the amount of fibres protruding from the structure of the yarn and if not controlled causes the formation of balls on the surface of yarn thereby making it rough but it also act as a coolant to prevent yarn breakage while knitting is in progress. As the knitting machine runs 24 hours a day it generates a lot of heat around itself and the wax coating starts melting as the machine crosses 70-80OC thus making it necessary to install a humidification unit in the floor to make the atmosphere around the machine ambient. All the major textile products are hygroscopic in nature which has the ability to take on or give up on moisture, thereby changing their state. They are particularly sensitive to humidity changes in their environment and when these materials finally reach a balance where they no longer taken on or give off moisture they are said to have reached their Equilibrium moisture content (EMC). The problem begin when the relative humidity begins to drop and the air pulls moisture from the material and because of this the weight of the material is significantly affected resulting in economic loss to the organisation as all the textile materials are weighed at a constant value i.e. 60% R.H thus making it necessary to install a humidification system in the plant. When yarn is spun lot of loose fibres, called fly, are created which at times of knitting get spread in the air in loom shed. These fly are very vulnerable to static charges unless controlled and consistent humidity is maintained in both upper and lower limits to reduce the generation of static charges. Maintaining relative humidity is not an easy task in India because temperature varies from season to season, sometimes even within a day. This only makes the job of textile air engineering team more important in an industry. Technology for achieving this is very simple: we have to add moisture to the air but the technology to install and maintain is utter laborious. Adiabatic systems are widely used in Industries and other spaces where controlling the humidity level is crucial for smooth run of production and providing healthy environment. Humidifiers using this process, exchange sensible heat of air with latent heat of water to accomplish evaporation (the heat in air gets used up in evaporating the water, thereby heats get released from the air) which results in drop of the air temperature. In other words, moisture is added to the air at the expense (or at the benefit) of a drop in the air temperature. When designing an adiabatic system, careful consideration must be made to the entering air temperature and humidity conditions. With the help of above equation humidity inside the room is calculated and accordingly the intake of air is controlled. Say if the humidity is at 30% and the plant is required to run at 60% R.H. then the air inflow through the plant is increased and when the humidity level is achieved as indicated on the controller screen based on the signals received for the sensor the air flow is lowered and a constant flow is maintained. Spray air washers using spray water as the medium for adiabatic cooling of air (by direct evaporation of water into the air stream thereby reducing the air's dry-bulb temperature and raising its humidity) are extensively used in humidification systems for textile mills. In this system there are robustly engineered rack which incorporates a system of high-pressure pumps, which pressurize the demineralised water and this ultra-clean water flows through a network of stainless steel tubes and then through the nozzles which injects water directly into the air. Each self-contained rack includes a programmable logic controller (PLC) system that allows the system to operate safely in automatic mode. Rakesh Ralhan is a Master in Fashion Technology from National Institute of Fashion Technology (NIFT), New Delhi.